When a paragraph in an evening newspaper reveals a decades-old tragedy, most readers barely give it a glance. But for three strangers it’s impossible to ignore. I had heard great things about The Widow but never read it so when i managed to get a copy of this from a book exchange i was very excited, as you can from the synopsis not alot is given away, just how one small story is going to change alot of peoples lives. Kate is a journalist and has had her big break a long time ago and nothing much since, in a place where more and more people are loosing their jobs daily she is constantly seeking something big, something to keep her safe. When a small story appears in the paper, about a babies body being found buried on what is now a building site. Kate wants answers, who is the baby? why was it buried? She takes it upon herself to get those answers! Meanwhile, others are noticing the story and some panicking, some remembering and some grieving we start to follow Kates investigation as she discovers secrets you cannot even think of. 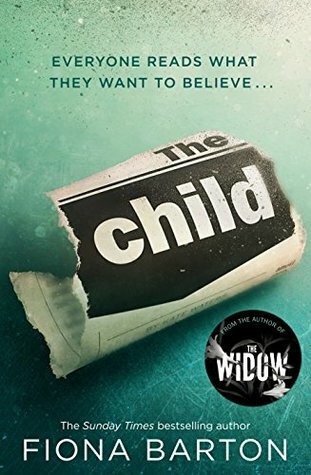 The Child was a wonderful read, i guessed some of it pretty early on, then decided i had it wrong - then nope, its correct - but not what it seems and thats what i love, it seemed so obvious but then it wasn't. I love something that keeps you guessing, that keeps you looking for answers and reasons and Fiona has done a wonderful job. I love a thriller that is realistic and you know that in real life it could happen - its not too far fetched, and it was well paced that it kept me interested without my brain hurting! My career has taken some surprising twists and turns over the years. I have been a journalist - senior writer at the Daily Mail, news editor at the Daily Telegraph, and chief reporter at The Mail on Sunday, where I won Reporter of the Year at the National Press Awards, gave up my job to volunteer in Sri Lanka and since 2008, have trained and worked with exiled and threatened journalists all over the world. But through it all, a story was cooking in my head. The worm of this book infected me long ago when, as a national newspaper journalist covering notorious crimes and trials, I found myself wondering what the wives of those accused really knew – or allowed themselves to know. It took the liberation of my career change to turn that fascination into a tale of a missing child, narrated by the wife of the man suspected of the crime, the detective leading the hunt, the journalist covering the case and the mother of the victim. Much to my astonishment and delight, The Widow is available now in the UK, and around the world in the coming months. However, the sudden silence of my characters feels like a reproach and I am currently working on a second book. My husband and I are living the good life in south-west France, where I am writing in bed, early in the morning when the only distraction is our cockerel, Sparky, crowing. Thanks for sharing this snippet about the book, I want to and grab it and spend and afternoon reading it.